Enjoy reading and share 83 famous quotes about You By My Side with everyone. 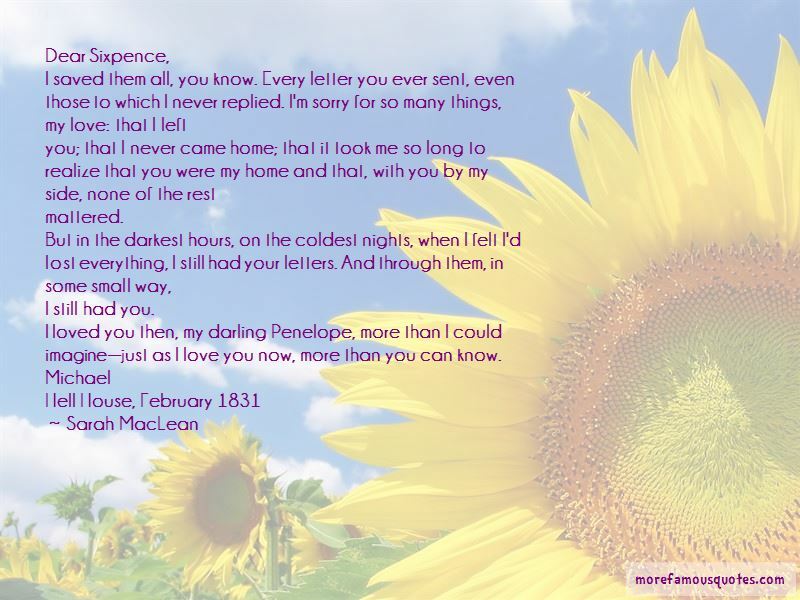 I loved you then, my darling Penelope, more than I could imagine-just as I love you now, more than you can know. “You realize that is you allow me to court you, all your opposition to marriage is going to have to be reconsidered." She smiled, feigning innocence. "What opposition to marriage?" "But I'm thinking we should have a long courtship." "Because i find I've developed a taste for adventure." "That sounds dangerous. Not at all in character for a delicate flower." She laughed." We know I've never been good at being a delicate flower. Besides, it shan't be too dangerous." She smiled brilliantly at him, taking his breath away. “I want you to know, if you ever read this, there was a time when I would rather have had you by my side than any one of these words; I would rather have had you by my side than all the blue in the world. “She's Warrick's sister," he said, aiming to sound disapproving and very nearly managing it. "Yeah, and that's why you want to screw her. Because they have that weird identical twin thing going on, even though they aren't." Her eyes narrowed. "In fact, I bet you've thought about doing both of them at the same time. Side-by-side comparison. Or top-and-bottom comparison." “Look,Nik.I can't lose you. We can be partners.With you by my side,and with the band backing us,we could take over. I want you by my side in the High Court?" "What does that even mean? We'd be ... together? Like, together, together?" Cole gave a sly smile. "We'd rule hand in hand. And as far as being together, we'd be as together as you'd allow." Annoyingly,my cheeks got all warm, and I turned away, frustrated at my reaction. I stood and went over to my desk chair to sit down. Cole chuckled. He pushed himself off the floor and walked closer to me,and the Shade at my shoulder pulled toward him. I wanted to hit it. "Stay over there," I said. “But if you take off your clothes, I'm sure I can get them dry." My eyes went wide. "Are you trying tog et my naked?" His silvery gaze met mine. "Do you really need me to answer that?" “I want you by my side. Forever. “This hand says you spend the rest of your life with me," he said, holding out his left hand, "and this one says I spend the rest of my life with you. Choose." She bit her lip, tears welling in her eyes. She took both of his hands in hers and he shuddered. "I will die protecting you," he says. There was a look of dismay on her face. "Just like a man of this kingdom, Finnikin. Talking of death, yours or mine, is not a good way to begin a-"
Isaboe gave a small gasp when he leaned forward, his lips an inch away from hers. "I will die for you," he whispered. just get stupider, more selfish. Colder and grimmer. You forget your keys. You leave the house and panic that you won't remember where you live. Want to see more pictures of You By My Side quotes? 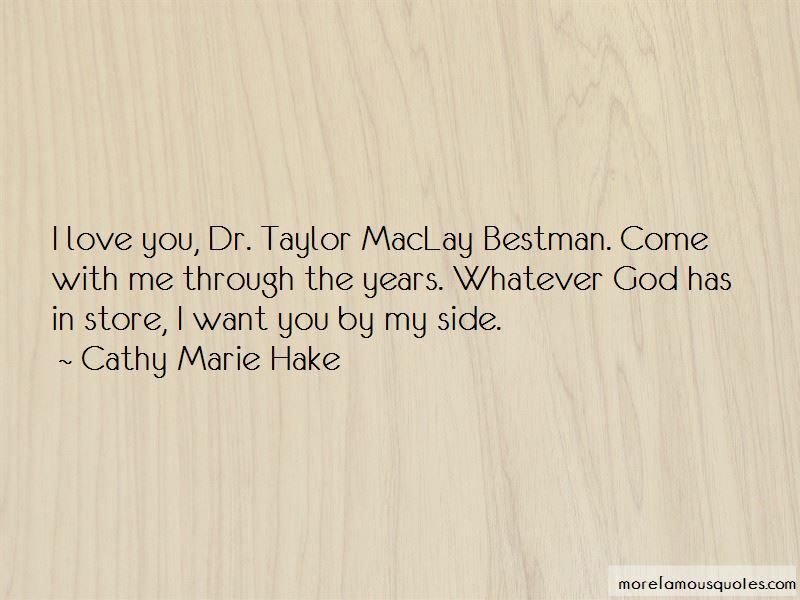 Click on image of You By My Side quotes to view full size.